Synthetic peptide conjugated to KLH derived from within residues 100 - 200 of Human TIGAR. Our Abpromise guarantee covers the use of ab37910 in the following tested applications. WB 1/250. Detects a band of approximately 30 kDa (predicted molecular weight: 30 kDa). Probable fructose-biphosphatase. Lowers cellular levels of fructose 2,6-bisphosphate. Protects cells against reactive oxygen species and against apoptosis induced by p53/TP53. Belongs to the phosphoglycerate mutase family. 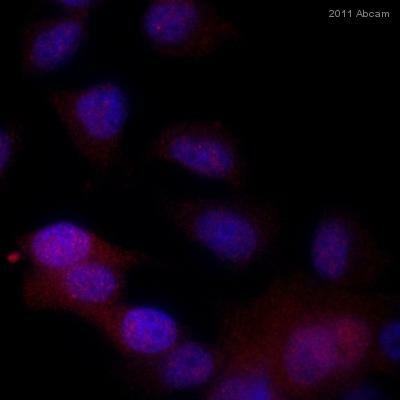 ICC/IF image of ab37910 stained HeLa cells. The cells were 4% formaldehyde fixed (10 min) then permeabilised using 0.1% PBS-Triton and then incubated in 1%BSA / 10% normal goat serum / 0.3M glycine in 0.1% PBS-Tween for 1h to further permeabilise the cells and block non-specific protein-protein interactions. The cells were then incubated with the antibody ab37910 at 1µg/ml overnight at +4°C. The secondary antibody (pseudo-colored green) was Alexa Fluor® 488 goat anti- rabbit (ab150081) IgG (H+L) preadsorbed, used at a 1/1000 dilution for 1h. Alexa Fluor® 594 WGA was used to label plasma membranes (pseudo-colored red) at a 1/200 dilution for 1h at room temperature. DAPI was used to stain the cell nuclei (pseudo-colored blue) at a concentration of 1.43µM for 1hour at room temperature. 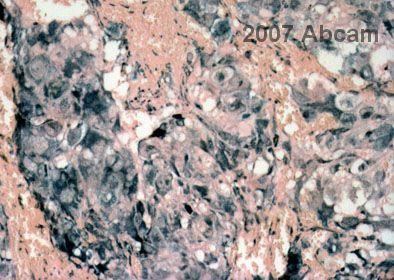 ab37910 staining human adrenal tissue sections by IHC-P. Sections were PFA fixed and subjected to heat mediated antigen retrieval in citrate buffer (pH 6) prior to blocking in 10% serum for 1 hour at 25°C. The primary antibody was diluted 1/200 and incubated with the sample for 1 hour at 25°C. 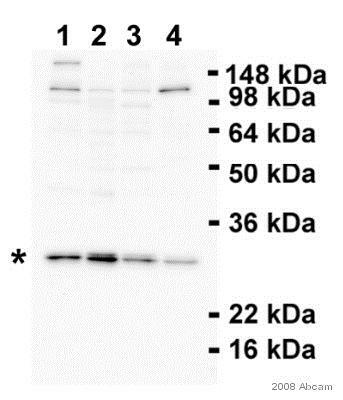 A biotinylated goat anti-rabbit antibody diluted 1/400 was used as the secondary. Publishing research using ab37910? Please let us know so that we can cite the reference in this datasheet. I recently purchased antibodies directed at GLS-2(n=2) and TIGAR (n=2) for Western blot application and was wondering whether you could supply me with a positive control for these? Can you confirm whether or not u87 lysates can serve as a positive control for the detection of glutaminase 2 (GLS-2) through Western Blotting? For TIGAR, we recommend any of the lysates shown in the western blot on the datasheet. We do not, however, have free samples. For GLS2, ab113509 was validated for western blotting on blots of rat kidney lysate. We have this as ab29480. We have another GLS2 antibody, ab91073, that was validated on a lysate of K562 cells. For U87, I found a western blot image via Google Image (search terms: U87, GLS2) that indicates a U87 lysate will be an appropriate positive control.